mini-beasts, lichen and mosses. We harvest food from some tree species including apples, pears and plums. Their height, width and colour make our communities aesthetically pleasing and most important they filter our air supporting our communities in combating climate change. Trees are a species not typically associated with the open wet bogland habitats of Ireland however Monica Mentle, a volunteer with the Irish Peatland Conservation Council explains ‘native species such as downy birch (Betula pubescens), silver brich (Betula pendula) and willow (Salix species) form a bog woodland habitat that has priority conservation status under the EU Habitats Directive. Getting involved in National Tree Week is a great opportunity to highlight these habitats and the services they provide’. 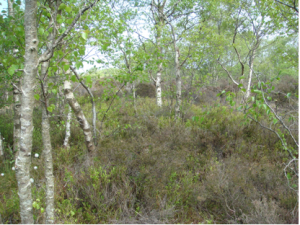 Joining the event you can expect to learn about bog woodlands and make your own leaf and fruit identification swatch to help you identify the variety of tree species found in your local community. Visitors can also get hands-on and learn how to construct a bug hotel from fallen branches, a feature that will enhance wildlife in gardens this Summer. Féile an Dúlra is a festival of nature organised annually by the Irish Peatland Conservation Council with funding support from Kildare County Council. This entry was posted in Events and tagged Bog of Allen Nature Centre, Events, Family Nature Activities, Lullymore, Things to Do, Wildlife. Bookmark the permalink.